Siana did great sleeping through the night again...in fact, she slept until almost 9am. We hurried down to breakfast before they closed at 10am. We played around in the hotel room after that, since we weren't leaving for the orphanage until 1:30pm. We were trying to keep Siana awake until then so she can sleep in the car. But by 1pm she was literally falling asleep sitting up on the floor. 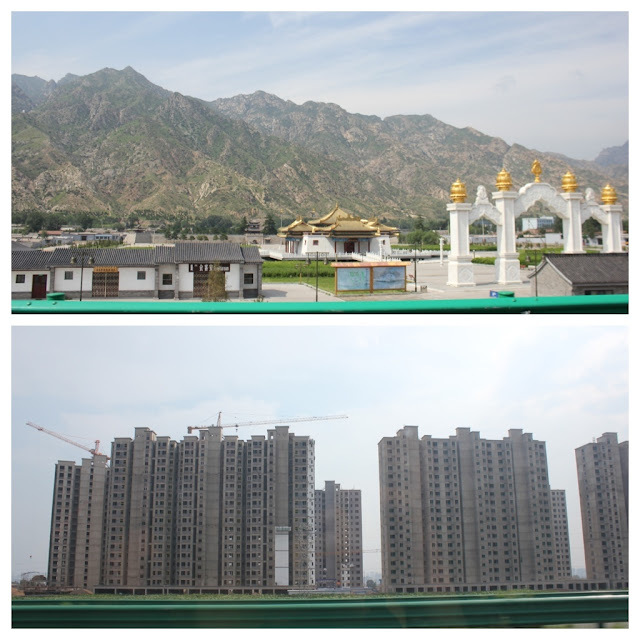 At 1:30 we started our journey to Baotou, the city where her orphanage is located. At first she thought it would be fun to sit with her sisters...(by the way, all the clothes I brought for her were too big). But she quickly wanted out of the back and snuggle with Daddy instead. She fell asleep for a little while, then sat on Daddy's lap for rest of the ride there and back. It took almost 3 hrs to reach Baotou. Here are some pics I took on the way. The above picture is what I mean when I say buildings are being built everywhere. We see a site like this every few miles. We finally reached Baotou. Aggie said it's the largest city in Inner Mongolia. It has 2 million people (like Hohhot), but its land mass is twice as large as Hohhot. It's also the industrial capital of Inner Mongolia. Aggie said Baotou means "Deer City." 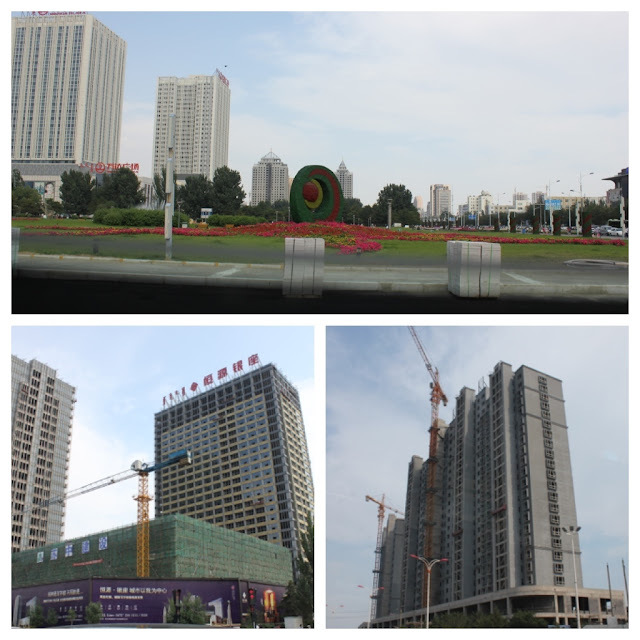 The top picture is a famous square in Baotou. After a long drive, it was a quick stop at the orphanage (maybe 20-30 min). This is the entrance to the building where she lived. When the staff first starting coming over to her, she didn't cry, but she didn't really go to them either. She quickly wanted to come back to where we were. We then took the elevator upstairs to see her sleep and play room. 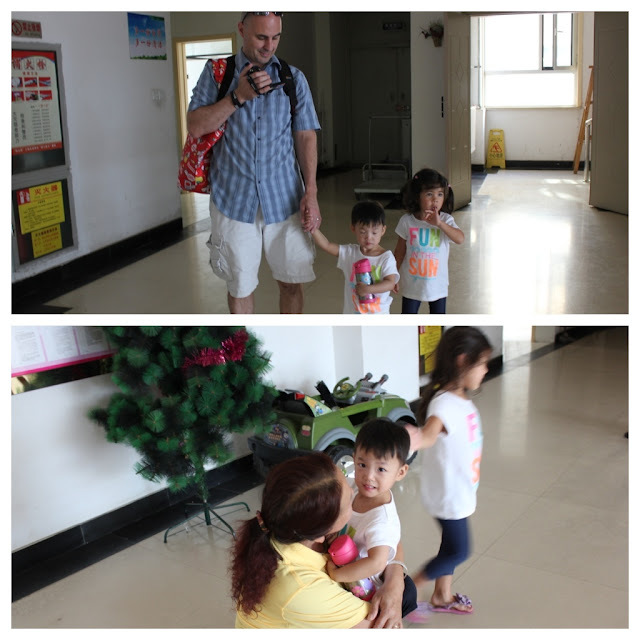 We were greeted by many more nannies, and she quickly jumped into their arms. She was like a little superstar there. All the nannies were so excited to see her. It was so great for us to see that she was so loved there. The top picture is the play room, and the bottom picture is her crib. I was impressed by how clean the place was, and the staff-to-children ratio seems to be small. There were nannies everywhere. 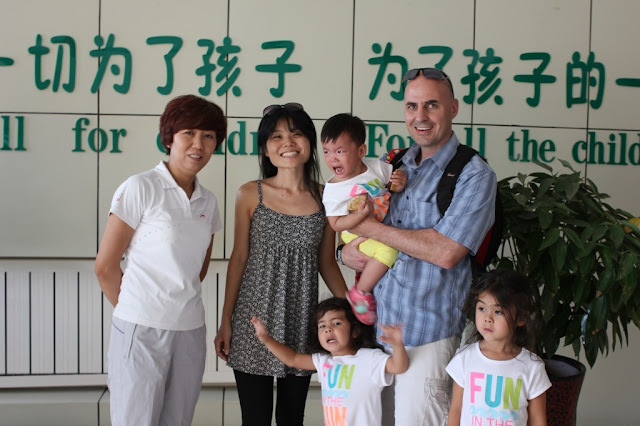 We met her main nanny and her best friend from the orphanage. They were so happy to see each other. It was very cute. The nannies loved watching every moment of it. 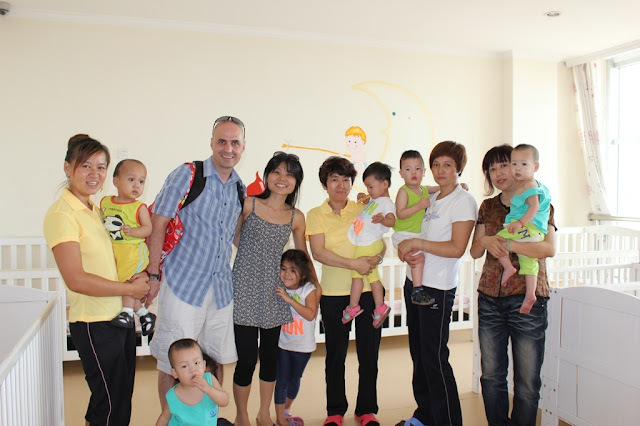 We took a group photo with the staff and other children (of course, Siana is not looking at the camera). Towards the end of the tour, Siana was getting more upset. Here is a picture with whom Aggie said was the "dean" of this department. She carried Siana (they all call her "Fang Lu," which is her Chinese name) and walked us out of the building. She then handed her off to us. I hugged her and said one of the only few words I know in Chinese - "Xie Xie" (thank you). Allan did the same. She said something in Chinese - Aggie translated and said, "She hopes you will bring her back here someday." I nodded in agreement. We were both in tears by this time. 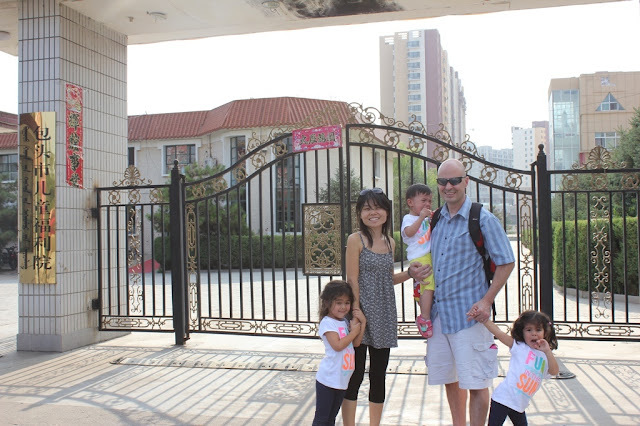 Walking away from the orphanage as a family of five really made it feel official. We visited one more building (her classroom) before we left the premises. As Aggie had said, they definitely seem to have more boys at the orphanage. 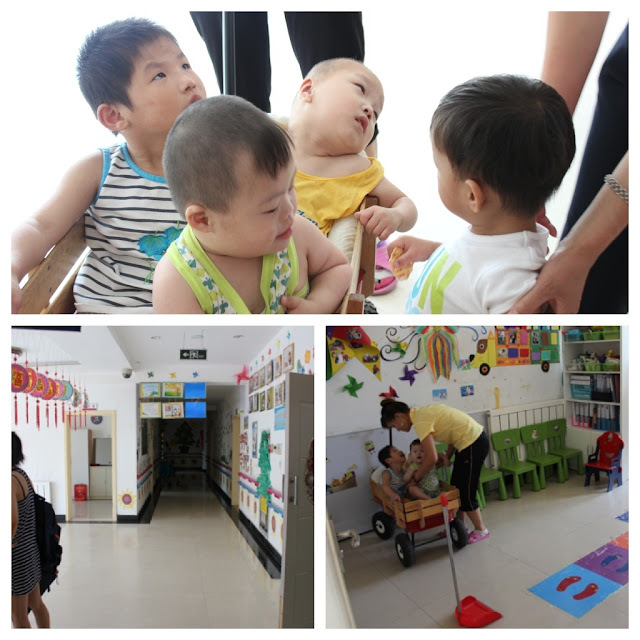 It was hard to see the other children, but it was comforting to know that they are so loved by the nannies there. Aggie said some families now are preferring girls over boys (to keep as their child) for practical reasons - she said when you have a son, you will eventually have to buy him an apartment, which is so expensive. We saw a lot of special needs children as well. 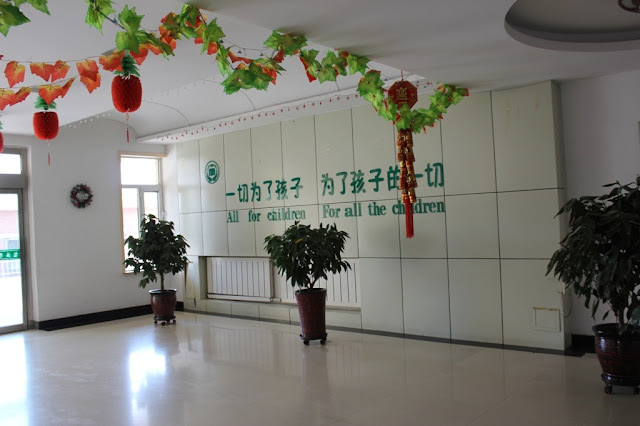 The whole place was called Social Welfare Institute of Baotou - orphanage is just one part of it. 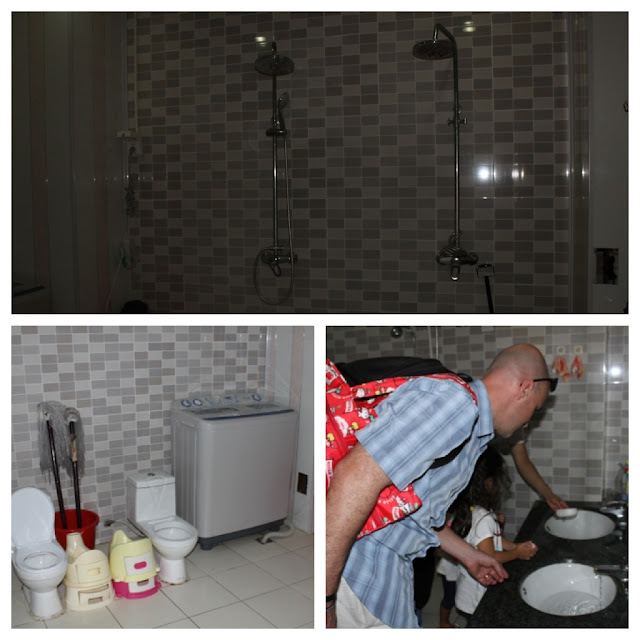 They have facilities for adults with disabilities and for seniors. We took a picture at the entrance. The black Canon camera seems to make her extra upset. She was crying here and there (mainly at the end of the tour), but bringing the camera out always made her blow up. Once we got back into the car and she was back on Daddy's lap, she returned to being content. 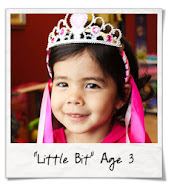 From my observation so far, she doesn't fit any extreme of what other adoptive families had described. Some said the child will attach only to one parent. So far she definitely favors Daddy but is OK with me holding her as well (for the most part). Some said the child will refuse to go back to the nanny (or the opposite - be upset about going back to the adoptive parents). She loved seeing her nannies again. But after they were out of sight, she quickly stopped crying. She seems so adaptable to whatever situation she's placed in. Before we went to the orphanage, I wasn't sure how she would react. 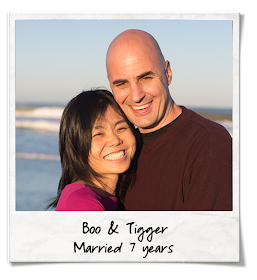 Our agency told us that it's important for us to bring her back there and for us to see how she's received by nannies who took care of her. They were right. I'm so glad that we got to see how much she was loved and cared for. We took plenty of video as well, so that she can watch them in the future. I am praying for the other children...that they will find their forever family soon. 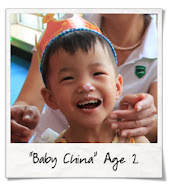 Our agency is starting a special partnership with her orphanage (starting in August). They will bring their own medical staff from the U.S. to examine the children and start preparing their files. I'm excited that some families from our agency will most likely be adopting many of the other children in her orphanage. The drive back felt long too. LB is doing a little better. Considering how much we have dragged them along on our crazy adventures, we're so grateful for our little troopers. Tomorrow night we fly to Guangzhou. Not going to lie - looking forward to some western food and Starbucks! Maria, how amazing that you and Allan did this! Congratulations on your new arrival. I assume you'll be back in Florida soon and we can see your new treasure. Wow Maria! I had a little alone time tonight and I thought I would "treat" myself to a few of your posts. I laughed and cried, I love your blogging and your genuineness. I feel like I was with you all along. Well, I started from the beginning and I couldn't stop......and here I am, so I am hanging on for tomorrow's post. What a delightful little angel. 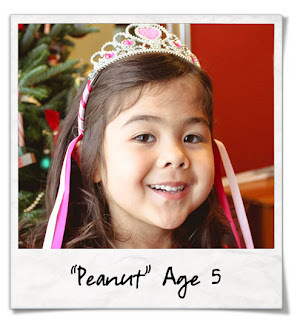 She absolutely seems to be the perfect fit for your family. I don't think it could have been any better! Love to you all, how is Allan?